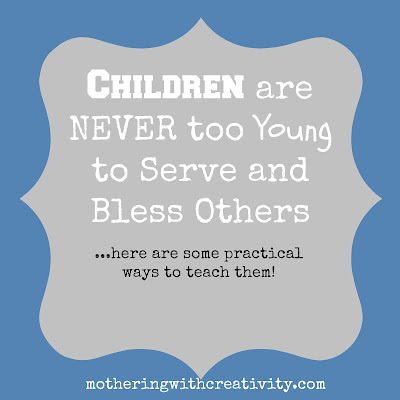 A number of years ago, my husband and I became actively purposeful in teaching our children to serve and bless others. I want my children to always think of others, and so we purposely teach them to do so. There is always going to be someone you can help, even if you yourself are not in the best position yourself. Helping someone doesn't just mean money. It can mean your time, energy, love, words of encouragement, passing on something you no longer use, and others. At no point is a child "too young" to begin learning to love others, and at no point should "I have young children" ever be an excuse for you to not help others. Ever. Since how we serve others often DOES change because of the ages of our children, I wanted to do a post with some of our practical ways of serving, loving, or helping other people. Children learn through hands-on experience. The more they can be involved, the better. 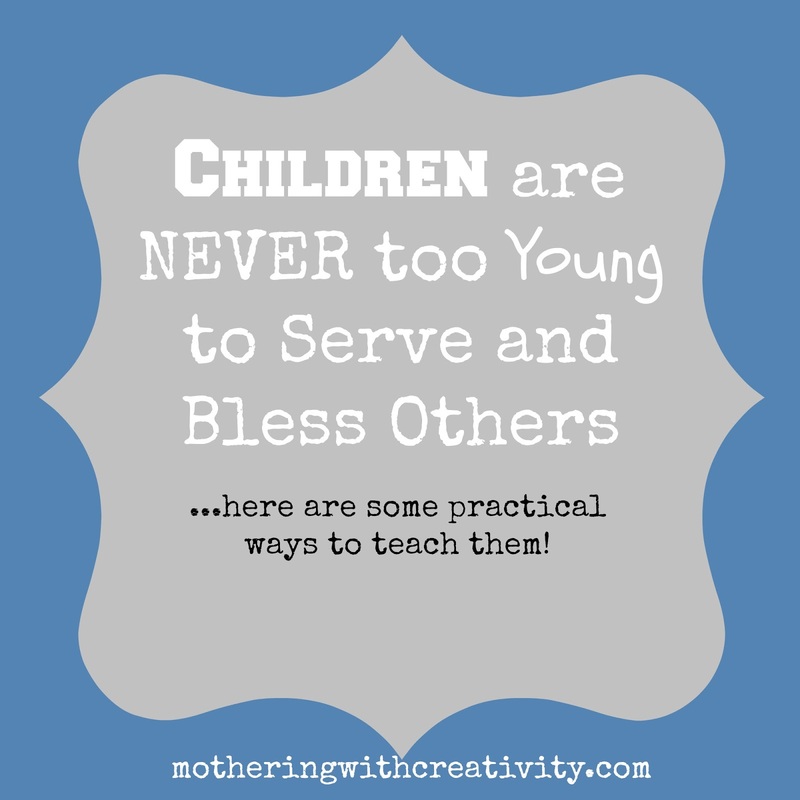 So, here are 5 ways were are currently helping our children learn to serve others. There are many other ways, we do others, too, and I'm sure you have some ideas to add to the list (I'd love to hear them!). For reference, our children are currently 8, 7, 5, and 2. 1. Donating used toys and clothing. Although I will often gather up some of their un-used belongings and throw them in a donation box myself, I regularly ask them while cleaning, "is there anything in your room that you aren't using anymore that another child without toys might enjoy?" So rather than it being about them and their clean room, I turn it outward-towards other children and how they can help make someone else happy. This gets their little heads thinking about how they could bless another child, instead of always complaining about getting rid of stuff (they still regularly complain, don't worry). 3. Serving food to the homeless. For a while, I stayed home with the little boys while Ben took the girls to feed the homeless on Sunday, simply because of their ages and it was very difficult. But in the past few months, we have all been able to wake up early every Sunday morning and head downtown to feed the homeless. 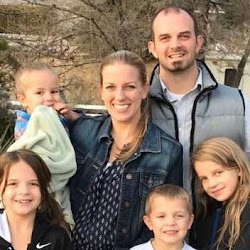 We serve at the Reno Sparks Gospel Mission in our city, which I love because it is a safe environment for my kids to join in with us. There are others in our city (and yours too, I'm sure). Some of them are in open spaces outdoors (not as accommodating to young children), and others are at a specific location. Some places allow children to serve, others do not. We choose to serve food because it is a very tangible way of helping others, and our children get to actually interact with the people they are serving. 4. Give random gifts. So, for anyone who knows me, this will not come as a surprise. I am a gifts love language person. I LOVE giving gifts to show my love and appreciation to people. We'll do things like call an employee or teacher at our child's activity before hand and ask what their favorite coffee drink might be, and then we'll pick it up on the way to class for them. Sometimes I'll see something that reminds me of someone at the store and we'll pick it up for them "just because." I often allow a child to be the one to pass on the drink/gift/whatever. It makes them SO happy to give a gift. 5. Random acts of kindness. There's always something you can do for someone else. During the recent heat wave, we kept cold waters on hand and my children stalked the window for the mailman each day. They'd run out with a cold water and totally make his day! It was just SO hot outside, and they walk a ton each day. You can send someone a sweet note, have your kids draw them a picture, or bring a neighbor some goodies you baked. If you have a skill, use it! My husband offered to fix our neighbors fence that blew down recently. It's a little bit of labor, but blesses someone with his kindness. Bring your children along with you. Let them hand you the screws or hold the boards in place. Teach them that being kind is never a waste of time. It is always important. There are SO many other ways to bless, serve, and show love to others. Bring your kids along in the process, and we can raise a generation of children who think beyond themselves and can easily spot ways to help others. I'd LOVE to hear your ideas! How do you currently teach your kids to serve?